به‌منظور بررسی امکان و شرایط بهینه کشت زعفران در منطقه تبریز، آزمایشی در مزرعه تحقیقاتی دانشکده کشاورزی دانشگاه تبریز به‌صورت فاکتوریل در قالب طرح بلوک‌های کامل تصادفی با سه تکرار انجام گرفت. تیمارهای آزمایش شاملآ استفاده از دو اکوتیپ کاشمر و مرند در 4 سطح وزن بنه مادری (3 تا 5، 1/5 تا 7، 1/7 تا 9 و بیش از 9 گرم) و در دو روش کشت کپه‌ای و ردیفی بودند. نتایج به‌دست‌آمده نشان داد که شاخص‌های عملکرد بنه زعفران به‌طور معنی‌داری تحت تأثیر وزن بنه مادری و روش کشت قرار گرفتند، اما تأثیر دو اکوتیپ مورد کاشت معنی‌دار نبود. استفاده از بنه‌های مادری با وزن بیش از 9 گرم بیشترین تعداد کل بنه دختری در واحد سطح (65/342 بنه در مترمربع) و بیشترین عملکرد بنه‌های دختری (9/892 گرم در مترمربع) و همچنین بیشترین عملکرد گل را نشان داد. بررسی شاخص‌های گل‌دهی زعفران در سال 91 نشان داد که با افزایش وزن بنه‌های کشت شده، عملکرد گل نیز افزایش یافت. به‌نظر می‌رسد تولید بنه‌های با وزن بیشتر و به دنبال آن افزایش عملکرد گل، نیازمند استفاده از بنه‌های مادری درشت در زمان کشت می‌باشد. همچنین بیشترین عملکرد کلاله، در روش کشت ردیفی نسبت به کشت کپه‌ای مشاهده گردید. نتایج حاصل از تأثیر دو روش کشت بر تعداد و وزن بنه‌های دختری تولید شده، حاکی از برتری کشت ردیفی نسبت به کشت کپه‌ای بود. در مجموع، استفاده از بنه‌های مادری با وزن هفت گرم به بالا و نیز کاشت بنه‌ها با روش ردیفی تأثیر مثبتی بر رشد و عملکرد زعفران نشان داد. In order to evaluate and access the best conditions to cultivate saffron in Tabriz, an experiment was conducted at the Agricultural Research Station of the University of Tabriz (Khalatpooshan), in a factorial experiment based on randomized complete block design and three replications. The treatments included two ecotypes of saffron in 4 levels of mother corm weight (3.1- 5, 5.1- 7, 7.1- 9 and more than 9 g) and two planting methods (row and mass). The results showed that corm weight and planting method had significant effects on the number and weight of replacement corms. But there was no significant effect on the different ecotypes. Among the experimental treatments, corms with 7.1- 9 g weight lead to the highest total corm number (342.65 corm.m-2) and corm yield (892.9 g.m-2) and the yield of flowers and stigma of saffron. It seems that for production of larger replacement corms and increased flowering yield, we need to culture large maternal corms. In addition, we observed the best economical yield that is determined by amount of stigma, in row planting method. The results showed that row planting method leads to a higher amount and yield of replacement corm production in comparison to mass planting method. As a result, producing corms with high weight followed by increasing of flower yield requires the use of large maternal corms for cultivation and row planting method. Ahmadi, M., and Bahrani, M.J. 2009. Effect of nitrogen fertilizer on yield and yield components of three sesame cultivars in Bushehr Province. Journal of Sciences and Technology of Agriculture and Natural Resources 13 (48): 123-131. (In Persian). Amirghasemi, T. 2001. Saffron, Red Gold of Iran. Ayandegan publication, Tehran. (In Persian). Arsalan, N., Gubruz, B., Dpek, A., Ozcan, S., Sarthan, E., Daeshian, A.M., and Moghaddasi, M.S. 2006. The effect of corm size and different harvesting times on saffron (Crocus sativus L.) regeneration. In proceedings 2nd International Symposium on Saffrron Biology and Technology, 28-30th October 2006. Mashhad. Iran. pp: 113-117. Baydar, H., Turgut, I., and Turgut, K. 1999. Variation of certain characters and line selection for yield, oil, oleic and linoleic acids in the Turkish sesame (Sesamum indicum L.) populations. Turkish Journal of Agriculture and Forestry 23: 431-441. Behnia, M.R. 2008. Effect of planting methods and corm density in saffron (Crocus sativus L.) yield in Damavand region. Pajouhesh-va-Sazandegi 79: 101-108. (In Persian with English Summary). Behnia, M.R. 2009. Effect of planting methods and corm density in saffron (Crocus sativus L.) yield in damavand region. Pajouhesh and Sazandegi 79: 101-08. (In Persian with English Summary). Daneshvar Kakhki, M., and Farahmand Gelyan, K. 2012. Review of interactions between e- commerce, brand and packaging on value added of saffron: a structural equation modeling approach. African Journal of Business Management 6 (26): 7924-7930. De-maastro, G., and Ruta, C. 1993. Relative between corm size and saffron (Crocus sativus L.) flowering. Acta Horticulturae 344: 512-517. Eberhart. S.A., and Russell, W.A. 1966. Stability parameters for comparing varieties. Crop Science 6: 36-40. Eghbali, S., Rashed Mohassel, M.H., Nassiri Mahallati, M, and Kazerooni Monfared, E. 2008. Allelopathic potential of shoot and corm of saffron residues on wheat, rye, vetch and bean. Iranian Journal of Field Crops Research 6 (2): 227-234. (In Persian with English Summary). Hassanzadeh Aval, F., Rezvani Moghaddam, P., Bannayan Aval, M., and Khorasani, R. 2013. Effects of maternal corm weight and different levels of cow manure on corm and flower yield of saffron (Crocus sativus L.). Saffron Agronomy and Technology 1 (1): 22-39. (In Persian with English Summary). Hemmati Kakhki, A. 2003. A Review on 15 years saffron research. Khorasan Research Institute for food Science & Technology. Mashhad, Iran. p. 125. (In Persian). Kafi, M. 2002. Saffron, production and processing. Ferdowsi University of Mashhad Press. 276 pp. (In Persian). Kafi, M., Rashed Mohasel, M.H., Koocheki, A., and Mollafilabi, A., 2002. Saffron, Production and Processing. Zaban va Adab Press, Iran. (In Persian). Kaushal, S.K., and Upadhyay, R.G. 2002. Studies on variation in corm size and its effect on cormel production and flowering in Crocus sativus L. under midd hill conditions of H.P. Research on Crops 3 (1): 126-128. Koocheki, A., Rezvani Moghaddam, P., Mollafilabi, A., and Seyyedi, S.M. 2014. Effects of corm planting density and applying manure on flower and corm yields of saffron (Crocus sativus L.) in the first year. Journal of Agroecology 6 (4): 719-729. (In Persian with English Summary). Koocheki, A., Tabrizi, L., Jahani, M., and Mohammad-Abadi, A.A. 2011. Performance on saffron agronomic characteristics and corm under different planting patterns and high corm density. 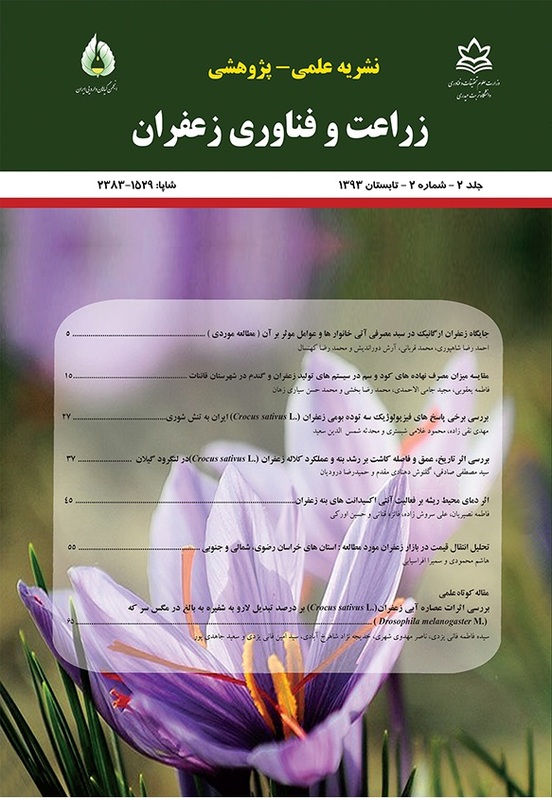 Iranian journal of Horticultural Sciences 42: 379-392. (In Persian with English Summary). Mashayekhi, K., Soltani, A., and Kamkar, B. 2006. The relationship between corm weight and total flower and leaf numbers in saffron. In proceedings 2nd International Symposium on Saffrron Biology and Technology, 28-30th October 2006. Mashhad. Iran. pp: 93-96. Molina, R.V., Garcı`a-Luis, A., Coll, V., Ferrer, C., and Valero, M. 2004. Flower formation in the saffron (Crocus sativus L.). The role of temperature. Acta Horticulturae 650: 39–47. Molina, R.V., Valero, M., Navarro, Y., Guardiola J.L., and Garcia-Luice, A. 2005. Temperature effects on flower formation in saffron (Crocus sativus L.). Scientia Horticulturae 103: 361-379. Mollafilabi, A. 2012. Effect of extensive range of corm weights on yield components and flowering characters of saffron (Crocus sativus L.) under greenhouse conditions. In 4th international safron symposium. 22-25th October 2012. Kashmir, India. Mollafilabi, A., and Shooridh, H. 2009. Novel methods of Saffron production. 4th National saffron festival. Torbat-Heydarieh, Iran. (In Persian). Namin, M.H., Ebrahimzadeh, H., Ghareyazie, B., Radjabian, T., and Namin, H.H. 2010. Initiation and origin of stigma-like structures (SLS) on ovary and style explants of Saffron in Tissue Culture. Acta Biologica Cracoviensia Series Botanica 52: 55-60. Ramezani, A. 2000. Evaluation of corm weight and climate on saffron yield in Neishaboor. MSc dissertation. Tarbiat Modares University. (In Persian with English Summary). Rezvani Moghaddam, P., Khorramdel, S., Shabahang, J., and Ghafouri, A. 2013. Evaluation of planting method, corm weight and density effects on growth characteristics and yield of saffron (Crocus sativus L.). Journal of Agroecology 3 (1): 52-68. Sadeghi, B. 2012. Effect of corm weight on Saffron (Crocus sativus L.) flowering (Research II). In 4th international saffron symposium. 22-25th October 2012. Kashmir, India. Temperini, O., Rea, R., Temperini, A., Colla, G., and Rouphael. 2009. Evaluation of saffron (Crocus sativus L.) production in Italy: Effect of the age of saffron fields and plant and plant density. Food, Agriculture and Environment 7: 19-23.